Is the milk bottle old-fashioned? Do you think this is a blast from the past? You wouldn’t believe it! What a shame! Dina and Masterchen were hiding plastic milk bottles in our fridge. Not anymore! Without further ado, we choose a milkman from the milkman-net who delivers every second day his fine unpasteurized milk to our doorstep. The real thing, you know! What a cosy sound when he placed our two bottles in front of our door. Proudly we picked up the bottles which we had paid with our pocket money. Ihr glaubt es kaum! Wisst ihr was? Dina und Masterchen versteckten übele Plastikmilchflaschen in unserem Kühlschrank. Damit ist jetzt Schluss! Kurzerhand suchten wir einen Milchmann im Netz, der uns alle zwei Tage seine fein unpasteurisierte Milch in Glasflaschen vor die Tür stellt. Wie gemütlich war dieses leichte Klappern, als er heute Morgen unsere Milch lieferte. Stolz holten wir die beiden Flaschen herein, auch weil wir uns diese Lieferung von unserem Taschengeld abgespart haben. This entry was posted in England and tagged glass bottle, go green, milk, milkman, nostalgia, plastic bottles, plastic waste. Bookmark the permalink. I remember milk being delivered to our house as a child in glass bottles. I always looked forward to the truck. It’s funny but for us, it very has much to do with a romatic feeling and a good conscious concerning sustainability. No way, I’d love to have my milk delivered in a bottle every morning! Your post brought back lots of memories from my childhood. Unfortunately, in Stockholm today, we do not have a milkman delivery. What a shame! Wishing the four of you a lovely evening. when our dear Master was a child it was normal to get your milk from the milkman. And Dina liked it so much seeing all the milk bottles on her way to her college in Cambridge. This is so funny. Last night I thought about daily milk deliveries for the first time since, well, more years than I’ll admit to being alive. I was even thinking of writing a blog post about it, how the world has changed. And now, someone beat me to it… I guess in places, the world changed back to a better way. yes, we agree. Sustainability brought up a certain nostalgia for the better. Oh dear, we took away a topic you want to blog about. The good old milk bottle has so many aspects. There are many blog post about possible. If I do a post on milk bottles, it will be a far, far different post than this. i just think that it is so strange that I had thought about it and then saw this. I think trying to stay with local food at all levels as much as possible is the way to go. Great ideas mostly come to several people at the same time. Hegel attributed it to the Zeitgeist and Edison always had the windows closed because he thought the ideas will kind of fly out and can be caught by other people. Anyway, we look forward to your post. you can’t get real milk in Berlin and no milkman is left there? We had the feeling that the Germans are always avantgarde concerning ecology and healthy living. Ah, scenes from my childhood!! from our dear Master’s childhood as well and from Dina’s time as a student in Cambridge too. All of a sudden we see those milk bottles everywhere on the doorsteps in our village. Oh, just gorgeous! I wish we had the possibility as well! Lucky you, fayeries! we are very proud of our two beloved fayries. What would we do without them? Now we struggle with all the cables of notebooks and smartphones as they are wicked. They all run out of power at the same time. We both love and despise our devices. I do anyway. So helpful, how did we get along without? But those batteries! Fab Four of Cley – you did it now!! Wow am I jealous!! I remember the last time I had the ‘real stuff’ and I was even allowed to drink the cream on top as a treat. Yes, you have sure brought back some fond memories! Thank you. we are very happy that we could trigger fond memories for you. Well, milk bottles are a kind of lifestyle we love and the cream top is delicious. Siri and Selma always drink it immediately after they brought the bottles in. dairy had the best lemonade in the summer, a real treat on those hot, humid days, before the advent of air conditioning. Those were the days! yes, those were the days and fortunately, they have come back now. Our milkman delivers other local products as well but we are getting the milk only. Milk in bottles? Last time I bought something like that must have been back in the late 40thies? Our dear Master remembers milk deliveries as late as the early sixties. I guess the upgrade to milk cartons didn’t come simutaneously all over the world? So a bit dependant on where one was living, I guess . . .
You are right. F.e. in England the milk delivery has never stopped, in Germany it’s getting in again like in the UK, in the US it stopped around the early sixties. Milk in cartons like Tetrapack is unusual in the UK, here you have plastic bottles. Anyway, there seems to be a trend bringing the milkman back. We all have to do the shopping and love doing it online in our cosy kitchen with a fine cup of tea. I love your new trend, it’s not old-fashioned at all, in fact, it’s totally cool! Not only a great support for the elderly (not you, of course) – but WE NEED TO START A REVOLUTION. We HAVE to reduce our reliance on plastic. I remember milkman deliveries. He came early in the morning and on especially cold winter days you had to get the bottles in right away so the milk wouldn’t freeze. our beloved Dina and our dear Master used to live in quite cold places and they had the same problem. If they weren’t quick enough getting the milk in they got frozen milk. I used to sneak a spoonful of cream from the top of the milk bottle. Delicious. at ours Siri 🙂 and 🙂 Selma sneak all the cream from the top of our milk bottles. Well, they love it and run around with white moustaches. We live in a village that is called “The Mecca of Bird Watching”. Our milkman puts a mug over the top of the bottles otherwise all the cream is gone. I had the same delivery this morning! !Two bottles os organic semi-skimmed, with green tops. The milkman came before 5am! our milkman delivers the milk much later but it doesn’t matter because we love to sleep until 9h. Siri 🙂 and 🙂 Selma told us that he comes around 8:30h. Indeed, the milkman is iconic English, isn’t he? Here it is kind of fashionable again getting unpasteurized milk delivered in the morning. It’s an important part of English lifestyle. Siri 🙂 and 🙂 Selma are preparing a big demonstration for real milk in bottles and the good old milkman. They are busy painting banners right now. The mermaids are helping them because it will reduce the amount of plastic ending up in the sea and they could even win Poseidon to help them. A fine cause indeed! Happy times, Fab Four. indeed, Siri 🙂 and 🙂 Selma running around with that white moustache looking very funny. That’s wonderful, how nice! Good for you, Siri & Selma. I was sorry that when I was going to school in Hull, having milk delivered to your doorstep (called the “front stoop” in New York) was long gone. Someone in England told me, that the electric milk floats were so quiet, you could hear the bottles tinkling as it came down the street. But in my village, we can still get milk in glass bottles from a local dairy. In the U.S., where “raw” milk is verboten in many states, the FDA has raided organic and Amish dairy farms – armed police storming barnyards, for selling unpasteurized milk ! My parents talk about another delivery service when they were kids: potato chips and pretzels! A company called Charles Chips would deliver metal canisters of salty snacks to your house. You sprites might try standing in front of the house, and calling out “Let the sky rain potatoes…” and see if the Charlie Chips man materializes. we didn’t know that unpasteurised milk is forbidden in the US. Here in England and on the continent buying “the real stuff” is coming into fashion. Now we are aware that most of our neighbours are getting the real milk delivered to their doorstep and of course from this electric milk vans. We suppose that our ecological consciousness is more developed than in the US (especially under your new president). Here one could get milk and much more from our milkman but we just stick to this delicious milk with the cream top. we decided for the milk delivery because the milk with that cream top tastes better and for ecological reasons. Siri 🙂 and 🙂 Selma are watching us not to use too much plastic that’s ending up in the sea. Our dear Master remembers the milkman coming around with his horse-drawn cart in Germany in the fifties. You are absolutely right! That’s the good old lifestyle having the milk delivered to your doorstep. The milk tastes better and it’s ecological much better. We think this higher price is okay, it’s not so much more, it’s okay. Congratulations on being able to turn back the clock to a time, when the milkman came by every day to deliver fresh milk! Do we need to wait until our world is choked to an environmental death by the plastic revolution, until finally we return to the wonderful recycling of glass bottles? Thank you, for making a small start into the right direction! we agree that it’s our responsibility for the environment to get the milk delivered and to reduce our plastic waste. It’s a small step, of course, but changes take place in one small step after the other. Siri 🙂 and 🙂 Selma were very adamant to make that change. They are right! I love the contrast of new bottles in an old wire rack. When I was a child growing up in South Florida the dairies switched to dark brown glass milk bottles. As I remember it, it was an attempt to keep the early morning tropical sunlight from affecting the milk, especially in the summer months when the sun was up early. we just had to opposite problem that the milk froze in wintertime and it took ages to defrost it. That’s clever with these brown glass bottles. we absolutely agree the milk you buy in the supermarkets is more like white water. All the goodies and all the taste is missing. And as you write it’s much healthier than the white supermarket water. everything tastes better from glass than from plastic and the milk is different as well, it's real milk with cream and not this kind of white water you buy at supermarkets. And you are so right the sound of the glass bottles is the perfect morning music. It's part of a happy beginning of the day. Now I’m feeling my age as I don’t remember milk bottles being delivered at all, only the sound of the postman’s whistle when he put something in our letterbox mid afternoon. It was always a race to go out to get the mail (and I really can’t tell you why it was so appealing). I do remember the lovely layer of cream at the top of the milk bottle though. I’d much rather have recyclable glass containers than all this plastic rubbish. the postman blew a whistle when he delivered your mail. That’s great! Unfortunately, our postman has no whistle anymore. Most of our visitors (on this blog) remembering the milk delivered by the milkman praise the cream on top of the real milk. We love it as well but we hardly get it because Siri 🙂 and 🙂 Selma drink it immediately. Greedy fairies they are! yeah, our beloved Selma is very clever, isn’t she? And you should see Siri 🙂 and 🙂 Selma running around with their milk moustaches every morning. Cute! Go glass I say – if you can. I remember milk being delivered to the doorstep and the birds pecking through the top to reach the cream in winter when it froze and the cream popped up. The dairy nearby sells raw and pasteurised milk to the public now and I might just go and buy some. You can use your own clean containers or buy recyclable plastic or glass bottles. Most milk is homogenised to distribute the fat globules evenly to prevent the cream from separating and rising to the top. Some research suggests that homogenising may alter the amino acids found in milk, transforming them into allergic proteins that are not recognised by our body’s immune system. we didn’t know that homogenising the milk changes the amino acids. Thanks for telling us. We know that unhomogenised milk tastes much better and it’s healthy not only for your bones. You are quite lucky having a dairy nearby where you can buy “the real stuff”. Well, we have our milkman. Our milkman puts a cup over the bottles for preventing the birds stealing the great cream. Wonderful! when I lived in England I had milk delivered ( glass bottles in those days) I really liked it. and the milk had cream floating on the top. There is no milk delivery where I live now. We buy our milk at the grocery store and it is in plastic bags that we put in a dispenser and snip off one corner to pour the milk . The milk is still delivered in glass bottles in England. When we lived in Germany we had this milk in plastic bags as well. This was prone to accidents. We remember how this milk bags quite often fell down or we squeezed it too much that milk ended up on our floor. We love the good old glas bottles and it’s so much more ecological. Have a good weekend to you as well! Great post you All. I have fond memories from my childhood in Germany taking our glass bottles to a milk store, where the fresh milk came out from a pump and oh, the Joghurt with a creamy top, in brown glass bottles. we remember this as well. We had our special milk containers in which we got the milk pumped by the milkman, later the milk was delivered in glass bottles like we have it here now. And this yoghurt with the creamy top, YUMMY. It was the children’s duty to get the milk from the milkman and around his cart, all the children met. It was a game to swing the milch churn that fast around that you didn’t lose a drop. But sometimes one was not fast enough and ended up bathed in milk. Big trouble at home then. Hallo Ihr Lieben, neben Shakespeare und Schiller fällt mir noch die Band „Herman Hermits“ mit „no milk today“ ein, na ja! Klar doch, lieber Jürgen! Wie konnten wir die vergessen vor lauter Milch der frommen Denkungsart, was übrigens eine eigenartige Metapher ist. Eine Denkungsart mit Milch zu vergleichen, da hätte meine Lektorin “schiefer Vergleich” angemerkt. Da ist “no milk today” zwar traurig aber stilistisch klarer. We too have milk delivered in glass bottles to our door. It’s hard to believe it’s still possible. But rinsing out the empty bottle and putting it back on the step beats sending plastic for recycling! it seems to us that more and more people change to the old system of milk delivery, at least it seems so in our village. And as you write much better than sending plastic for recycling! yes, it’s great that more and more people buy real milk and milk products as well as vegetables from the farmers. We think all that tastes much better than the supermarket stuff. And as you write you can use the real milk for making delicious yoghurt, soft cheese and kefir. When we were children we loved set milk with sugar and cinnamon and of course the cream from the top of the milk. We use the milk as it is and don’t boil it. Fabulous. I remember milk in glass bottles delivered to the door when I was a child. The best I can do now is to buy organic, unhomogenised milk from a small-scale dairy. In NZ where one large company has a virtual monopoly on dairy products, even this is an achievement. here in England seems to be a trend back to the milkman and the real milk. There are so many reasons for doing it: taste, sustainability, romantic feelings etc. Siri 🙂 and 🙂 Selma will work for it with their fairy magic! Thank you Fab Four. I suspect Siri and Selma’s magic could be our best hope. Wishing you a happy week too. Ok, langsam muss ich mich wohl auf Englisch switchen, sprachentechnisch..
Also, ich hatte mit Wein gerechnet nach dem Brot und jetzt steht da Milch in den Straßen – In Flaschen! Ok, eigentlich ist Milch ja nur für Babys oder? Kann man lecker Cheese und Icecream machen und Pudding!! Vor meiner Tür steht mittwochs immer die Abo-Kiste der Blattlaus mit Gemüse, Wasser und Milch in Flaschen, bisher kam noch kein Dieb vorbei und hat die Sachen stibitzt, aber die nette Frau der Balttlaus klingelt auch kurz…. Es gibt soooooo viel Milch-Musik, am eindringlichsten fand ich das Lied aus “Elisabeth”…aber zu viel Milch – und du musst kotzen…. Trinkt ihr pur oder mit Kaba? wir trinken unsere Milch im Kaffee – Masterchen liebt Milchkaffee – und im Tee. Wir benötigen sie auch für den Grundansatz für unseren Sauerteig und manchmal trinken wir sie pur. Wir haben sie noch nie mit Kaba getrunken. Wir wissen gar nicht, ob es Kaba hier gibt. Als Kind in Deutschland hatte ich stets ein Schüsselchen, das auf die Fensterbank in die Sonne gestellt wurde, für Sauermilch. Die aß ich liebend gerne mit Zucker und Zimt und noch besser mit Erdbeeren. Hatte ich euch schon erzählt, dass ich mal ein Frauen-T-Shirt drucken wiollte: Wir haben die Miclh, wir haben die Macht! ? Eine meiner Freundinnen trug es, Körbchengröße D, das war der absolute Burner! wir können uns noch aus unserer Zeit in Deutschland an den Spruch ‘Milch macht müde Männer munter’ erinnern. Ein T-Shirt mit ‘Milch macht’s’ als Frau mit großer Oberweite zu tragen, finden wir super und kühn! milk delivered in a pram that’s very special, we love it. Here comes an electric cart, well, that’s modern times. Better for you, better for the planet, all good 🙂 We are lucky to have our own milk producing goats and a small diary farm less than a km away, whose milk we collect in a churn when we are making cheese. By the way, if you have unpasteurised milk it is possible to make a very easy cream cheese using kefir as a culture, delicious. Happy to share a recipe if you fancy a go. Many years ago we made our own soft cheese with milk we had put a kefir in and that kefir was growing and growing. We divided it and shared it with friends – a very social food, indeed! Thanks a lot for reminding us of making cheese, we had it forgotten. It truly is a very social food, having received ours from a friend we keep growing, dividing and sharing 🙂 I think you have the same recipe as me, enjoy. We are afraid it got out of fashion. We don’t know anyone who has a kefir fungus nowadays. What a pity that is! it’s so kind of you offering us a kefir. Unfortunately, it isn’t the right time because we go to Norway to Dina’s hometown next week. I think the milk bottle delivered by the milkman is one of the great icons of England 🇬🇧 and we need to preserve this. The foil-topped glass milk bottle 🍶is not dead! I can remember that wonderful clinking sound of the milk bottles arriving early in the morning when I lived in Cambridge in the seventies (everyone had milk bottles on the doorstep then) and I love the nostalgic feeling of going back to bottles versus the plastic ones of today. What a shocking statistics that is. Good old days…we used to enjoy this too, but now the milk gets stolen from you doorstep! This definitely takes the biscuit, as Selma pointed pout. 😀 Wonderful nostalgic photo, it could have been taken some 40 years ago. I remember the milk bottle well and the rituals that surrounded them. Bringing them in before the sun had time to turn the milk or the birds had time to peck through the silver tops, washing the empties and putting them back out last thing at night. This was perfect recycling before recycling was an issue! Siri 🙂 and 🙂 Selma send their finest fairy dust to you! You inspired them to produce a big banner saying “Save our milkman and our postman as well!” written in red. We love those charming rituals around getting the bottles and getting them in and out again with a letter for the milkman and the money. We don’t need boring and polluting plastic bottles! I remember the milk deliveries well. We children raced to pull off the cardboard tab and drink the cream on top. Yum! I love the photo with the old door. Haha! We got four bottles, and there were four of us. Whew! War avoided here as well. You’re most welcome. Cool indeed! Reminds me of my youth, when we had milk delivered in a similar fashion. On our front steps, there was even a little metal box for the bottles. we love it to go back to the future with our decision. It’s exactly like you remember it. The rusty crate brings back a lot of memories. I remember some used to have a dial on to tell the milkman how many bottles you needed. Sometimes naughty schoolboys (not me) used to move them on a few 🙂 Great post. we write the milkman a little letter about the amounts and put it in the milk bottle. With a dial, very snazzy, indeed! And very tempting for a caper. we love our milkman dearly. Er bringt in einem Träger die Glasflaschen. Als Kind, das kann ich noch gut erinnern, kam der Milchmann mit Pferd und Wagen und pumpte die Milch aus einen Kessel in unsere mitgebrachten Milchkann. 1x pumpen 1/2 ltr. thanks a lot for this informative Guardian article. We actually didn’t know that we get our milk from milk giant Müller. P.S. : Dina is protesting. She knew it. It definitely does not get any fresher than coming directly out of the udder! you are absolutely right! But we don’t like warm milk, oh dear. Your blog post triggered so many memories! My father grew up on a dairy farm here in North Carolina and hated getting up in the middle of the night to milk cows and then deliver milk to homes before going to school in the mornings. When they married, he told my mother that he would be happy to buy his milk in a bottle at the store for the rest of his life. He didn’t miss the farming life at all! Your post also reminded me of the milkman that delivered bottled milk to our house when I was a teenager. He was afraid of our German Shepherd, so he would throw a popsicle to the dog. It took our dog just long enough to eat the popsicle for the milkman to run to the door, leave our milk, retrieve our empty bottles, and run back to his truck. Of course, I was jealous of our dog because I never got popsicles! well, our sight of the milk business was quite onesided seen from the consumer’s standpoint only. We can well understand getting up so early is really hard. Never the less, we like our milk deliveries in the morning. And we don’t have a dog – although Dina is a great dog person – frightening our dear milkman. For getting the milk in you should have got a popsicle! Thanks for your comment and for presenting the other side of the coin. We have gone back to the future with milk bottle deliveries. More environmentally friendly. You have to be aware though that there are some diseases can be transferred via unpasteurised milk. millions of people in the UK, on the continent and overseas drink unpasteurised milk and they are healthy and fit. We all did very poorly in chemistry, therefore, we can’t tell if it’s right that pasteurizing the mild changes the amino acids in something neutral. It’s said it takes the best out of the milk. Thanks for making us think about it. It so normal here that one takes it for granted. Wir finden das auch “voll süß”. Es ist ja erschreckend, wie sehr man Sklave des Zeitgeistes ist, jetzt wird das richtig ‘in’ hier. Alle unsere Nachbarn werden vom Milchmann beliefert und plötzlich sehen wir Artikel über “the good old milkman”. Toll, wir lieben es nach dem Motto “Back to the Future”. we found that rusted holder perfect for this picture as well. So these holders were and so they are still. One of the best photos of a “Milkman” is this one from 1940, during the London Blitz. Although it was staged, it’s quite wonderful, and the explanation certainly makes sense. Even in such circumstances, the milkman was a sign of normalcy. Thank you very much for this link to the picture of the postman. Iconic for England! It’s amazing how much this picture expresses, really cool. When we lived in Vermont we bought our milk at the Amish farmer’s shop as well. It said ‘Shake well before using’ on our bottles too but we wanted the cream from the top and therefore never shook it. Even before milkman deliveries, my mother and her sister used to bring milk home from their grandparents’ farm in buckets. They’d skim the cream from the top and whip part of it. Chocolate cake and whipped cream always was a Saturday night treat. Thank you very much for your commentary. We are happy that we could trigger good memories with our post. And now we experience it exactly like your description of the milk delivery. I still buy milk in bottles from two local dairies where the cows are grass-fed. The milk is so much better and the cream so thick it hardly needs whipping. But more than that, the sight of those bottles is so sweet and simple and comforting—like a bit of childhood that endures. what else to say? You expressed all the beauty of getting the real milk. you surely have a fairy as a milkman. Hildi and Hulda, two fairy friends of Siri 🙂 and 🙂 Selma work not as milkmen but as milkwomen. That’s real emancipation that is! I managed dairy farms for many years when all my family drank unpasteurised milk. I Knew the herd was brucellosis free which can be contagious with the drinking of unpasteurised milk. You need to know the herd health status of your supplier. Thank you very much, dear Brian. As a consumer, we have to trust the farmer that the health status of his herd is high. We actually never thought about brucellosis. Thank you for making that point. But what can we do besides follow our feeling? Milk in glass containers is a tradition that has come back to us. There is so much happening these days in food delivery. Many simply don’t have time to shop for groceries in a mega store; instead they chosen to embrace home delivery services. Amazon’s takeover of Whole Foods has opened new possibilities for on-line grocery shopping. But, deep inside, we all want to feel the heady excitement of going to a vibrant marketplace of “old” where we chat with neighbors and store vendors. Food has always been about community. Hugs coming across the way to my dear friends, the Fab Four of Cley. in Germany and some other countries of the continent, you still have the tradition of farmer’s markets – in some places twice a week. For a lot of people, it’s normal to buy fruit and vegetables at such markets where you can buy every kind of food. In England, the milkman is getting fashionable again, so we are following the Zeitgeist. And we started to buy our groceries online, as we don’t like shopping so much. But of course, with online-shopping, one misses the communication that is one of the highlights of shopping at an outdoor market. Thank you for the finest fairy dust! Last night, Vancouver experienced a snow storm. Today, the snow has disappeared and the sun has appeared. Fairy dust is powerful!! Hugs and love! we have a grey day today with light rain and quite warm. For us, snow is forecasted for next week. Siri 🙂 and 🙂 Selma are already quite excited. They would like to experience a snow storm. But they hope in vain, this isn’t a snow storm area here. I wish we could have that here, too! here it gets quite fashionable to have your milk delivered by the good old milkman. We wish you and Mary a great Sunday. It’s sunny here, more like spring than winter and so we worked the last days in the garden which is looking beautiful right now. It’s very graphic during winter time what we like. It might be interesting to know if people would like that service here, too. Home delivery is used more and more here, offered by the big supermarket chains. But that only means you order their goods online, and they deliver it to you. Maybe I should become the local milkman! 😀 Or maybe we should get ourselves a cow to milk. 😀 Mary, as a farmer’s child, surely knows how to milk a cow. Btw, Fredericksburg does have good recycling: we have a recycling center in the middle of town, and here at home we have 7 separate boxes for different types of trash. Plus, of course, our regular trash can for everything that cannot be recycled. Unfortunately, though, there’s no glass recycling. The city had it some years ago, but they could not find any company to sell the glass to! At least not in an acceptable distance to make a profit out of it. So they gave that up. But still, we’re quite progressive for Texas standards. Talking of milk: your post reminded me of my youth, when, as a child, I used to go and get our milk in a tin can from our local milk place. Here, we have an overcast and slightly foggy Sunday. Not too cold, and not too warm either, at about 18 degrees C. Next week we might even get some rain. Keep your fingers crossed: we need it so badly. So far, we’ve had only about 15 Liters/Square Meter, which is roughly 1/3 of what we usually get by this time of the year. Enjoy the remainder of your Sunday, and have a great week. as we don’t like shopping we get our food online what we think is much more convenient. But with the milkman it is indeed something different. When we read all these comments here nearly everybody has dear memories of the milkman – and of this different kind of milk with the cream on top. We could well picture you as the friendly milkman one has a chat with in the morning. For years this was the first winter that brought enough rain to bring us over the dry summers here. Siri 🙂 and 🙂 Selma are weaving some magic with rain dances etc. for you and they’ll talk to their friends, the weather fairies. There is something very special about seeing milk in bottles .. ! When I was in primary school each morning the children were given a small bottle of milk .. Might be something to do with the fact that we are a diary country. I was so amazed to read about the Indian milk delivery 😃 Great post! when our Master went to primary school in Germany you got a little bottle of milk there every day. Actually, you could choose milk or cacao, but it was out choosing cacao. For reasons we don’t understand it was seen a wimpy. There was a slogan “Milch macht müde Männer munter” (milk makes tired men lively). Yes, this Indian milk delivery was really amazing. But we have to admit we don’t like warm milk directly from the cow. Paddy the bread man and Jack the milkman!! I remember the milk being delivered from a horse drawn cart and then later a van. The bottles were topped with orange coloured foil. On winter mornings when the cream on top froze the birds came and picked holes in the top to get at the cream. Now I live in a village in Germany and can buy my milk directly from the farm. Thanks girls 🧚‍♀️🧚‍♀️ For bringing back all kinds of wonderful memories. Siri 🙂 and 🙂 Selma are sending their finest fairy dust to you. Our dear Master remembers too that the milk was delivered from a horse-drawn cart and, of course, he talked always a lot about that delicious cream on the milk's top. Thank you very much for sharing your memories. We didn’t know that you can use this cream for making ice cream. We have to try that as well. We hardly ever drink a cup of milk but we use quite a bit for our milk coffees, for the sourdough and in tea. We had milk deliveries until relatively recently – then the long-established dairy closed and was built over… No more clinking on the doorstep at dawn. But you’ve just prompted me to check online – found 2 leads quite near us to check out. Nice one, Dina! Our dear Master remembers the rag & bone man with a horse and cart. He rang a big bell going slowly down the streets. He was a wild man, at least our Master remembers him like this. And sometimes he even gave us children a few pennies for buying sweets. We are very lucky as our gardener likes to grind knives. He keeps all our knives sharp. But there are still folks coming around here asking if they could grind our knives and tools. All this, rag & bone man, knife grinder and even the milkman, seems to us very Dickensian – although we suppose that the milkman came a little bit later. Our beloved Dina is very happy that she could give you the hint for looking online for a milkman. We found our milkman there. I love this image and the idea of it. 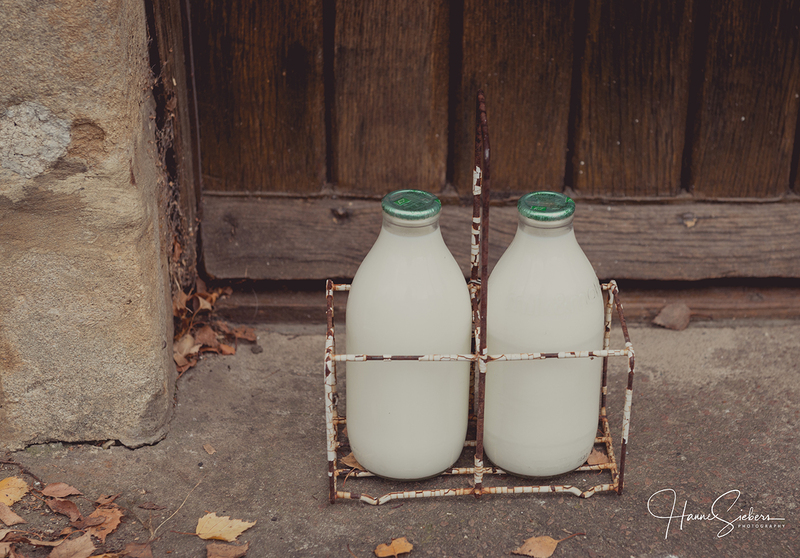 I have photographed old dusty milk bottles recently but the idea that the milk is fresh and everything else old here is captivating! Great work. milk bottles are a really interesting motive, aren’t they? And there are so many levels of it like their form/graphics and this white colour, sustainability, healthy food, romantic feelings and the ‘good old times’ etc. Interesting that opposition: fresh milk presented in the old ways, well, milk delivery it’s travelling back to the future. we hardly have it cold enough at the coast here that the milk will freeze. We don’t know about the summer yet as we just started. But we have to protect the caps against the birds who very much like our mild. Our milkman just puts an old cup over the tops. For us the romantic feeling as well as sustainability counts. indeed, the stuff is delicious! It tastes much better than this white stuff from the supermarket. That’s how we got our milk in the 1950s. We put two empty bottles with money in them at the end of the walkway from our house and the milkman picked them up and left full milk bottles in their place. In the winter, the tops would be pushed up a couple of inches as the frozen milk pushed the cardboard cap up. yes, it’s going back to ‘the good old times’. Although we don’t see ourselves as conservative we love it. Living in the bird sanctuary of the North Norfolk coast we have to protect the tops just putting a cup over them otherwise the birds will feed on our milk. LOL I hadn’t thought about that with the birds getting into the milk. They love the cream. They are quite greedy, well, decendants of the dinosaurs. Siri 🙂 and 🙂 Selma sometimes feel like little birds. They love to play being birds. Do you know the novel “Birdy” describing how a man transformed into a bird? The author is William Wharton. No, I’m not familiar with that novel, but I’ll check it out. I read it many, many years ago and found the transformation from person to bird fascinating. From its style, it isn’t a masterpiece, it’s quite conventionally written. indeed, one can re-use these bottles and actually, every food tastes better from glass than from plastic, not to mention all these ecological problems connected with plastic. Let’s call it retro. So old it’s cool again! the milk in glass bottles is more expensive here as well, but not very much, something like 20%. Amazing how important it is being able to make the perfect chappati. Oh dear, we buy chappatis in our local supermarket and just heat them up. Well, India is another world. But Siri 🙂 and 🙂 Selma wouldn’t mind the milkman coming around with a water buffalo. we try to do our little bit saving our dear old earth. milk straight from the cow, oh dear, we don’t like warm milk. For us, the milk either has to be cold or we drink it in our coffee or tea. The milkman is the right solution for us, a cow on our doorstep we couldn’t handle neither. we very much like the story of the drunken milkman and his horse 🙂 🙂 GREAT! We didn’t see our milkman yet as he comes around when we are dreaming of cows and green fields. Siri 🙂 and 🙂 Selma want to get up early one of the next days and try to catch a glimpse of our milkman. They will tell us then. In the Leicestershire village of Walton-on-the-Wolds, where we lived for a few years in the 1950s, we used to pop to the farm next door for our milk. With the milking shed and dairy right next door to the kitchen the bottle of milk was often still warm from the morning’s milking. I would watch the cat sitting among the unwashed pots and pans on the kitchen table while my mother chatted with Mrs Pick, the farmer’s wife. As Dina will appreciate, my Norwegian cousins found it hillarious that the family next door were called the Picks. that reads like in ‘the good old times’, very idyllic. Oh dear, our beloved Dina didn’t understand why ‘the Picks’ is that hilarious. ‘Picks’ is not a Norwegian word she knows. She is wondering what the connotation might be – and we as well. Dina has to think of it phonetically, as we didn’t write it down. Pikk. It’s interesting that modern linguistics follows the sound of words and sentences, not the notation. isn’t that stressful to have your milk all the time refrigerated? We can understand this because we don’t love warm milk. Warm milk is called yackyack-milk by Siri 🙂 and 🙂 Selma. Thanks for visiting and following our blog. Thank you and you as well.. Yes, it’s old-fashioned. And yes, it’s fantastic to be able to get milk delivered like that. I love it. we love getting our milk delivered by the milkman. We know, it’s a romantic idea. Especially Siri 🙂 and 🙂 Selma like that romanticism. yes, going for the old fashioned is sometimes a step back to the future. And this fresh local milk tastes so much better than the stuff from the supermarket. Iconic photo. How I loved deliveries of milk on our doorstep as a child. We primarily drink UHT milk from cartons aboard Amandla and powdered when that runs out. so you have to bunker quite some UHT milk. Well, we always have a carton of UHT milk in our store in case we run out of the ‘real stuff’. Where are you sailing right now? We have been to Cornwall watching huge waves just recently. We suppose you sail in the Southern Hemisphere right now. we keep our fingers crossed that you soon can start sailing the vast Indian Ocean. Siri 🙂 and 🙂 Selma talked to their friends, the Weather Fairies, to make sure that you’ll have great weather conditions for sailing. Wenn ich noch lange diese Milchflaschen anschaue, wird es in den Träumen immer bunter, klarer und interessanter…sind das Zauberflaschen? Stellt euch vor, meine Mutter kam am Dienstag zu meinem Yogakurs! Ein Wunder! Dankeschön Siri und Selma! Love is bottlefield not a battlefield?! Die Schafsmilch der Blattlaus hat auch dieses Topping aus Rahm und schmeckt so lecker, das Schaf schmeckt nicht vor, lecker! Geht es euch auch manchmal so, dass aus den besten Vorsätzen nichts wird? Im Gegenteil? Der Druck wird größer…man muss sich dann regelrecht austricksen? Wir haben hier auch haltbare Milch und Haferflocken für Notfälle..
Ja, ja, die guten Vorsätze … Wie heißt es, der Weg zur Hölle ist mit guten Vorsätzen gepflastert. Siri 🙂 und 🙂 Selma achten jedoch sehr darauf, dass wir unsere Vorsätze gleich umsetzen, ohne zu zögern oder sie wieder zu vergessen. Das machten sie auch mit unsere Milchbestellung beim Milchmann. Sie sind bei solchen Sachen blitzesschnell. Als wir in Griechenland lebten, hatten wir öfters Schafsmilch, die man übrigens hier auch im Supermarkt erhält. Wir stehen jedoch auf Kuhmilch. Allerdings trinken wir fast nie Milch pur, sondern wir haben sie im Kaffee und Tee. Wir lieben Milchkaffee, den die liebe Dina stets nachmittags für uns bereitet. Lecker! Der eine war so stark, dass er den Trockner ganz alleine heraustrug… Das war echt der Hammer! Ich staunte sehr! Siri 🙂 und Selma 🙂 lieben deinen Kuh-Spruch und setzten noch hinzu: ‘sie macht Milch dazu, die liebe Kuh’. Hier scheint die Sonne. Wir waschen Wäsche und werden gleich Bücher wegstauen. Mit unseren Büchern sind wir im Grunde ständig beschäftigt, aber wir leben es. …hättet ihr gedacht, dass man sich als Tänzerin mit dem Halteproblem bei Algorithmen beschäftigen muss/sollte?! Darauf erstmal einen Schoppen Kuhmilch! Klar doch, liebe Pia, Algorithmen können komplexe Bewegungen im Raum beschreiben, meinen zumindest Siri 🙂 und 🙂 Selma, die das in der Feenschule lernten. Hier hat’s übrigens heute Morgen geschneit, aber die Schneebedeckung ist mehr als dürftig. Morgen soll’s dann mehr schneien. Siri 🙂 und 🙂 Selma sind schon völlig aus dem Häuschen. Dir auch eine wunderschöne Woche und Abklingen des Muskelkaters. das war ja praktisch in Amerika, dass der Milchmann die Milch gleich in den Kühlschrank stellte. Bei uns stellt sie der Milchmann vor die Haustüre, was aber auch okay ist. Eine Kuh vor der Eingangstüre ist schon sehr speziell, frischer geht’s wirklich nicht. Aber wir lieben keine warme, frisch gemolkene Milch. Auch wir trinken fast nie Milch pur, aber wir sind große Freunde des Milchkaffees. We can get our milk in glass bottles, but as far as I know, we have to go to the store to do so. At least we have the option, though! we find it convenient that we get our milk delivered and don’t need to go to the shop. We don’t like shopping. we love that clinking noise of the glass bottles when the milk is delivered in the morning as well. And we agree, milk in glass bottles does the soul good, indeed! P.S. : Today we are active in your field. We were browsing antique and vintage shops and found a lovely old barometer. We happily bought it and now it hangs in our hall. Klausbernd kann sich ebenfalls an den Milch zapfenden Bauern mit seinem Pferdewagen erinnern, obwohl er in der Großstadt aufgewachsen ist. Ja, Milch aus Glasflaschen schmeckt besser, es ist ästhetischer, nachhaltiger und ganz viel romantischer und zu allem Überfluss scheint es auch ‘highly fashionable’ zu werden. Es liegt im Trend, und wir trotten fröhlich mit und finden den Trend gut. Siri 🙂 und 🙂 Selma lieben das ebenfalls. Sie machten es gerade heute Morgen. Siri 🙂 and 🙂 Selma talked to their cow friend asking to come around to yours. I’m so excited! I do prefer non pasteurized, natural, mike. It is much richer (to my taste). What days does he do south Florida? We agree unpasteurised milk tastes much better than the supermarket stuff that’s more like white water. Is this a true account of present days? Can you actually get milk delivered on the doorsteps – in glass bottles? I remember this from my childhood days with nostalgia. It was so long ago. I might have to find a new place to live! you wouldn’t believe it but milk delivery in glass bottles has never stopped in the UK. Now it’s getting popular again after a decrease. It might have to consider weighting milk delivery in glass bottles up against moving from Bergen. May you all have a lovely weekend. Fun! And … milking a cow at the doorstep? Such an intriguing image. 🙂 Very fresh, that. indeed, fresh as fresh can be. We would find it cool having a cow milked in front of our doorstep – although we don’t like warm milk. We cling to our milk delivery against the odds: it’s been part of our life since we had babies. The orders grew as they grew, clink, clink, Clink! Now the nest is empty but the milkman comes still. Now clunk! (plastic: the bottle washer died!) not clink! Then rumbles off up the lane, to nudge us from cosy sleep. we still get our milk in glass bottles, clink, clink, clink. We were naively thinking that all milkman deliver the milk in glass bottles. I have finally found a milk supplier who uses glass bottles. Unfortunately he doesn’t deliver to the door. But I buy the milk whenever it is available in the supermarket. And is the semi-skimmed milk supposed to be hot or cold? we think it’s supposed to be cold. – We have to admit we don’t like warm milk, Siri 🙂 and 🙂 Selma hate the skin on hot milk. Oh my goodness. When I was a little girl we got milk delivered. I would love the thought of it again! It’s got a bit of charm to it… doesn’t it? Such a wonderful and charming aspect of everyday life! We need milk right…. And now it can be delivered in glass bottles! I love it! Well done England! we love your expression ‘new-fashioned’ – GREAT! It seems to be that we are living in such a fortunate place. Fun to hear of the joy in the milk bottles and door-to-door delivery. Not quite as fresh as the milking at the door, but a wonderful way to bring freshness into your kitchen. Great photo too. milk delivery is connected with quite a romantic feeling for us and it’s sustainable as well. We love it! even for us, grown up in Norway, Sweden and Germany, milk in glass bottles radiates a nostalgic feeling. Here in England, it’s not that unusual. To read this, it evokes in many of us a nostalgic feeling that we would like to fall back on if possible! I do not think these are plastic bottles, but glass bottles? The idea is that innovation brings improvement, but this is not always the case. Sometimes the old methods are even better! As long as it remains environmentally friendly and healthy, I’m happy! I love the idea of milk being delivered. Great photo, too!